Protein is a chief component of the organs, skin, muscles and glands. Every cell and most bodily fluids contain protein. Dietary protein is needed to help repair cells and create new ones. Protein is also vital for bone health which is especially important for women. Women are nearly twice as likely as men to suffer osteoporatic fractures. A high protein diet is generally considered safe for healthy women when its limited to a few months. It's important to choose your sources of protein wisely when embarking on a high protein diet. Some high-protein plans recommend eating full-fat dairy products and red meat that may contribute to high cholesterol levels and increase the risk of heart disease. Dietary sources of protein are either complete or incomplete proteins, notes Medline Plus. Complete proteins contain all nine essential amino acids, while incomplete proteins lack at least one. 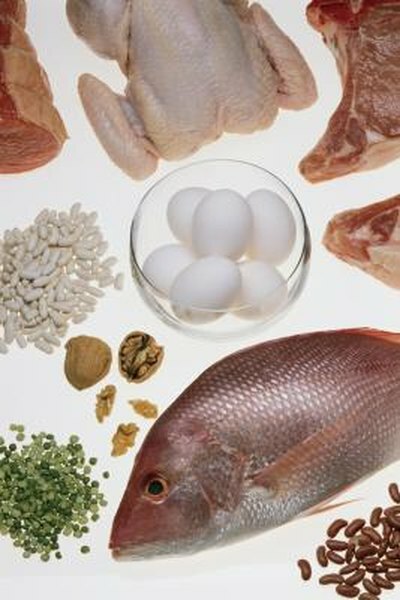 Complete proteins include meat, poultry, fish, soybeans, eggs, milk, cheese and other milk products. Incomplete protein sources are seeds, nuts, grain beans and peas. Vegetables also contain a minimal amount of protein. A study published in October 2008 in "Current Opinion in Endorcrinology, Diabetes and Obesity" found diets that moderately increased protein and modestly restricted carbohydrates and saturated fat may help manage weight metabolism levels. Researchers said potential safety issues associated with chronic high protein require further investigation. A high protein breakfast may consist of 4 scrambled eggs, 1 slice of multi-grain toast, 1 small banana and 1 small apple. Drink a protein shake for a mid-morning snack. Lunch ideas include 2 oz. of sliced turkey breast, 2 slices multi-grain bread, 1 tbsp. regular mayonnaise, 1/2 cup cottage cheese and 1 cup of baby carrots. Have a protein bar in the afternoon. A sample dinner menu includes a roasted skinless chicken breast, 2 celery sticks with no-fat cream cheese and 1 cup of lentil soup. Drink at least 8 glasses of water throughout the day. Talk to your health care provider before starting a high protein diet if you have diabetes, kidney or liver disease. A very high protein diet may exacerbate liver or kidney problems since you body may already have problems eliminating all the waste products of protein metabolism. PubMed: Benefits of High-Protein Weight-Loss Diets: Enough Evidence for Practice?